This low-wattage tube beast is ready to take over your studio. 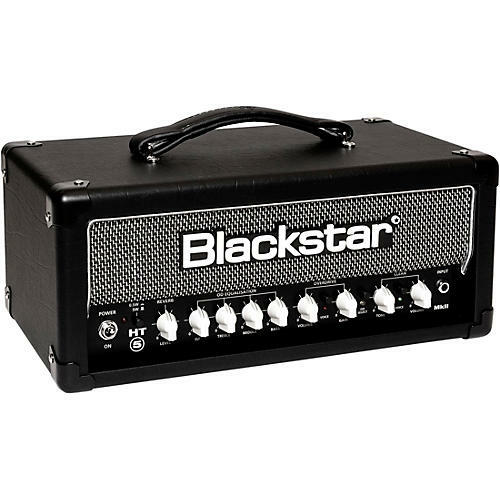 Killer tones and innovative features make the Blackstar HT-5RH MkII the ultimate studio and practice valve amp. Thanks to the unique 5W push-pull design utilizing the 12BH7 valve, it delivers huge tone at any volume. In addition to the re-voiced Clean & Overdrive channels, the new HT-5RH MkII features USB audio output, XLR D.I. out, studio-quality reverb, power reduction and refined cosmetics. Adding the features that guitarists have requested, plus stunning new boutique cosmetics, the new HT-5RH MkII redefines the compact valve amp. Using their push-pull valve power amp design, you get all the dynamics and response of a 100W stack from a small amp head. The HT-5RH MkII features Blackstar's best clean and overdrive tones, including sounds inspired by classic American & British amplifiers, from clear and punchy cleans to searing overdrive. Each channel is now equipped with a footswitchable voice mode, allowing for even more tonal flexibility. Joining Blackstar’s patented ISF tone control is a USB and balanced XLR outputs for pro recording, a power reduction switch, and a newly voiced studio quality reverb.